The police officer did not want to write a report after my car accident. Do I still have a case? West Covina car accident attorney, Lem Garcia, is often asked whether a car has to get totaled or if they can get the car repaired instead. Generally speaking, you do not have much of a choice. Whether you are going through your insurance carrier or the other party’s insurance carrier, your car is a total loss when the cost to repair is more than the value of your car. It’s understandable that you might want to get your car totaled instead of repaired. You might feel like your car will never be the same after being involved in a crash or that the value of your car has dropped because it was involved in a crash and you would rather just start all over with a new car. Unfortunately, the decision to have your car totaled or repaired is not up to you. The insurance company owes you the lesser of the value of your car or the cost of repairs. If the repairs are more than the value of your car, then you will get paid the value of your car. If the repairs are less than the value of your car, then your car will get repaired. Fortunately, you do have the option to have your car repaired by a body shop of your choosing, which is what we recommend. It is also understandable if you want to have your car repaired instead of totaled. You might owe more money on the car than what it is worth and if they pay your finance company the value of your car, you will still owe more money and be left with a balance due because you do not have gap insurance. In this type of situation, it would make a lot of sense for you to want to get the car repaired. 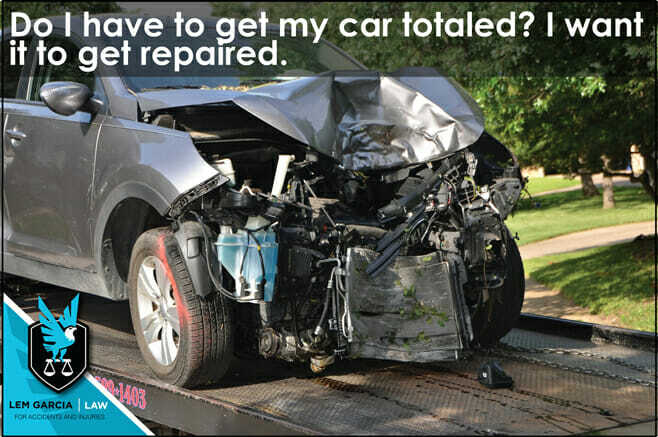 Unfortunately, the decision to have your car repaired or totaled is not up to you. Insurance carriers owe you the lesser of the value of your car or how much it would cost to repair your car. If the cost of repairs is more than the value of your car, then your car will get totaled and you or your finance company will get paid the value of your car. If you are upside down on your car (you owe more than what the car is worth), it important that you have gap insurance on your vehicle to cover the difference. Furthermore, generally speaking, in California the car insurance carrier may even declare a total loss when the cost of repairs are approximately 75% of the value of the vehicle. The reason why is because the insurance carrier needs to make sure that there is enough money to pay for rental cars, towing, storage and additional repairs (in the event that the car is still not operating properly after repairs). The close the cost of repairs reaches 100% of the value of the car, the more likely the insurance company will declare the car a total loss. When Lem Garcia Law, a personal injury law office in West Covina, handles your bodily injury case, we also help make sure your property damage claim gets handled properly as well. We do not charge more to handle the property damage claim – we do it as a courtesy to you to make sure that you get taken care of. West Covina car accident attorney, Lem Garcia, provides free case consultations without any obligation. Schedule your appointment today to discuss your case and find out what you need to do to protect your rights after you’ve been involved in a car accident.